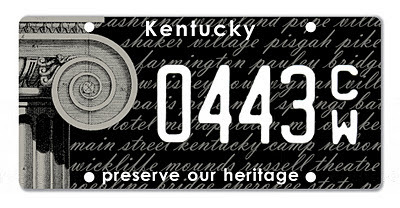 Preservation Kentucky, a non-profit "organization devoted to preserving buildings, structures, and sites in every region and every town in the state" has started an initiative to get a special license plate in Kentucky for those wanting to support historic preservation. This license plate is damn good looking. Graphic designer, preservationist and Lexingtonian Hayward Wilkirson designed it. Because it is so good looking and because it is for such a good cause, you should complete the online application to receive this special license plate - once 900 have applied, the state will commence production. More details are available on the PK website. This is a great cause, with $10 of every application (and renewal) going to "create a grant fund to help local communities preserve their important historic/prehistoric places." 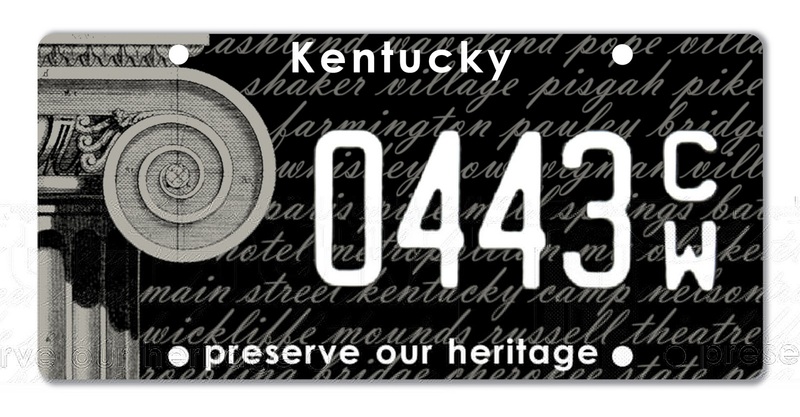 Other states have taken or are taking the initiative to try and get historic preservation license plates on their roads. Among them are Connecticut, Georgia, Idaho, and New Jersey. But their plates don't look as good as ours.